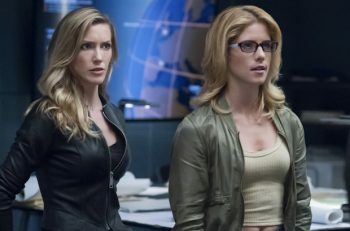 WARNING: The following article contains major spoilers from Arrow Season 7 Episode 7 titled “The Slabside Redemption.” Do not read if you have not seen the episode or read ahead at your own risk. After seven weeks into Arrow‘s seventh season, Oliver Queen (Stephen Amell) is finally a free man. Monday’s episode saw Olly finally being released from prison but it did not come without some blood, fire, and one epic showdown. The episode begins with a guard informing Oliver he will be released from prison in mere hours. We see Diaz being transported to Slabside as part of the deal still-evil-but-turning-good Laurel made with the feds. But of course, the guard transporting him is working for him and shoots the other guards, allowing Diaz to stroll straight into the prison where he visits Oliver, informing him he intends to kill him before his release. Let me just say, the tone of this scene is everything. From the music to the lighting to the solid acting from both characters. Anyway, Oliver tries to warn the guards about Diaz but they don’t listen, so he breaks out of his cell and the first epic fight scene takes place with Olly taking on all the guards. Diaz plans to make Oliver suffer before he kills him, so he hypes up the other inmates to kill and hurt the guards who imprisoned them. With Brick and Sampson beating up Oliver, Turner (Michael Jai White) breaks out of the hole and helps him – eventually teaming up with him. Arrow — “The Slabside Redemption” — Image Number: Arrow_707_Still_11_111918 — Pictured (L-R): Stephen Amell as Oliver Queen/Green Arrow and Michael Jai White as Ben Turner/Bronze Tiger — Photo: The CW — ÃÂ© 2018 The CW Network, LLC. All Rights Reserved. I really would not mind seeing Turner and Oliver team up again in the future but that’s unlikely. That said, this pairing was one of my favorites of the episode. 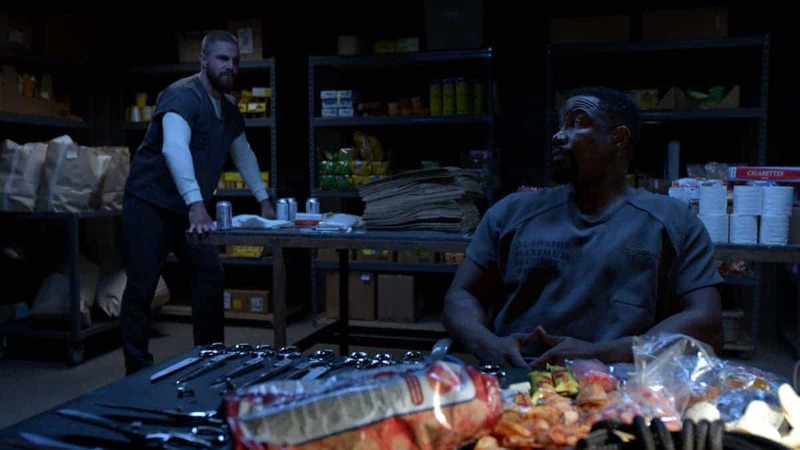 Turner points out that prison has changed Oliver – the old Green Arrow saw things as black and white but after his time in prison, Olly sees things as more grey, which may, in turn, make him a better hero. Interestingly enough, Amell did an interview with TVLine where he mentioned that fans will see the effects prison had on Oliver when he puts the suit back on. Okay so back to the recap. It is finally time for Oliver and Brick to go after Diaz, who has started a fire down in the mess hall. He wants to destroy the prison with Oliver in it. As Turner takes the injured guards to safety, we finally get the epic showdown. Diaz is much stronger than he was in the Season 6 fight because of all the serum he made a few weeks ago and comes close to killing Oliver. But then Diaz makes the mistake of mentioning Felicity and William, which gives Olly an extra boost, enabling him to get the upper-hand and subdue Diaz before locking him up in a cell. The episode ends with a bloody Oliver reuniting with Felicity (Emily Beck Rickards) as they share a kiss. As the episode began, Oliver mentioned to Stanley he knows he killed the guard and manipulated him into blaming Turner. Stanley replies and says that’s what the Green Arrow would do. Later, we see Stanley’s truly psychotic behavior come out after he ties up and drugs Oliver to try and get them to escape together, which Olly declines. Instead, he beats him up. Stanley later escapes through the morgue but not before killing Brick. I have a feeling this is not the last we see of Stanley.